The Robert Pile Educational Charity exists to assist anyone who has been resident in Alton Barnes, Alton Priors or Honeystreet for over 2 years with financial help for the furtherance of education. This is a local educational charity that has funds available to support the education of any resident of Alton Barnes, Alton Priors and Honeystreet who is in need financial assistance to access a course or educational activity. The Charity was set up on the proceeds from the sale of the old school in Alton Barnes. Applications can be for adult courses or for children but cannot be used to pay for what should be provided by the local educational authority. Courses or activities considered should be designed so as to improve an individual’s educational development or qualifications. Assistance is normally provided to cover up to 50% of the identified costs. Invoices have to be provided to the charity. The applicant needs to have been a resident for two years within the Parish. 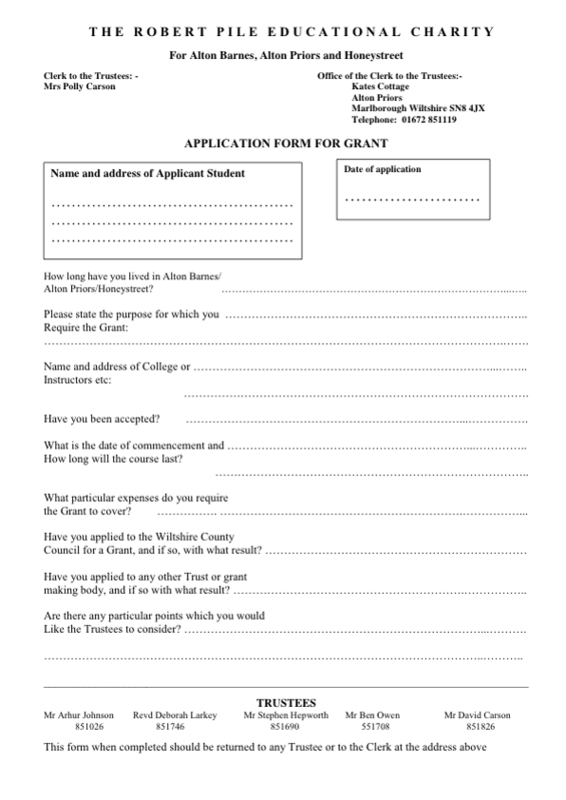 Application forms can be obtained by clicking this link or from any of the Trustees.